Suitest supports Smart TVs and set-top boxes equipped with a traditional infrared remote control. After setting up the device you will be able to automate device maintenance tasks and, provided that the device's apps are built in HTML - to run automated end-to-end tests. Devices having a traditional infrared remote control are operated by the CandyBox. 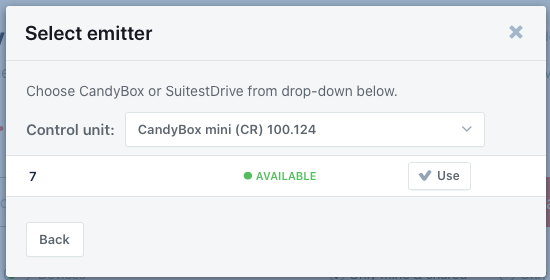 You can purchase the CandyBox through your account. 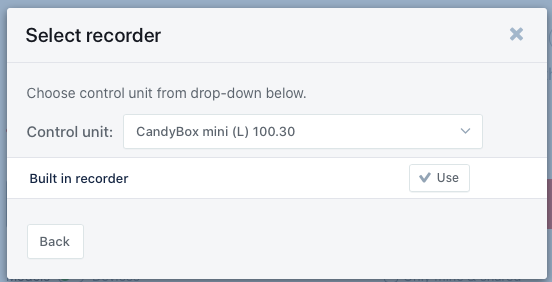 A single CandyBox can independently control 8 or 40 devices and you can have as many CandyBoxes as necessary in your account. Additional steps are necessary to properly configure an HbbTV / Freeview Play or an LG webOS device with Suitest. CandyBox operates the device in a way identical to your remote control - by sending the infrared signals to the infrared receiver of the device. Unlike the signal from the remote control which travels by air, the signal from the CandyBox is delivered through the wired blaster that should be placed on top of the device's infrared port. Open the Device wizard, select Add physical device, choose Other HTML based platform or Only configure device control (whichever applies better to your situation) from the platform list and then press Next. Select the CandyBox that you wish to take charge of the device and its port to which you have attached the blaster. Note that the emitter numbers in the Device Wizard correspond to the port numbers at the back of the CandyBox. 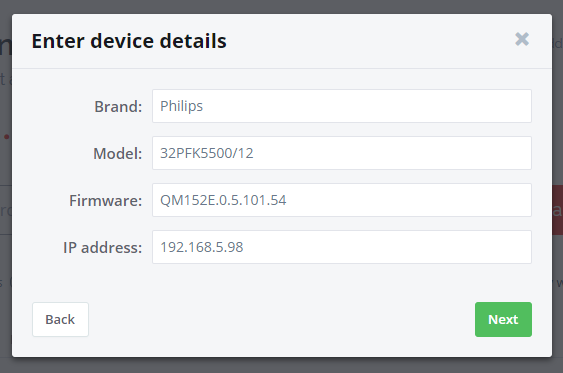 On HbbTV / Freeview Play platform Suitest can attempt to detect the correct emitter port automatically. For this function to work device should be tuned to the Suitest channel and the Suitest bootstrap application should be loaded on the device. Infrared codes vary greatly from device to device and sometimes even devices with the same model name have different sets of codes. It is important to manually verify that every button works as expected. The device wizard has a built in button test that will help you achieve this. Your CandyBox is equipped with an infrared sensor able to catch and record signals sent by your device's remote control. Before attempting to record the driver make sure that you have a clear line of vision to the CandyBox, so that the signal is guaranteed to travel unobstructed. 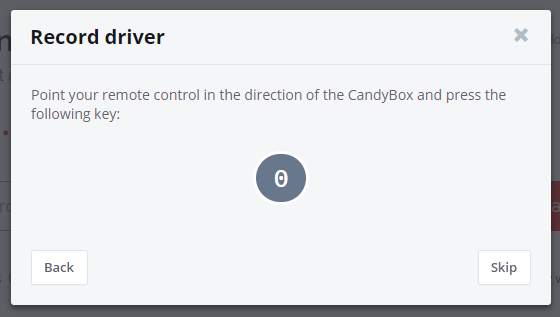 To record your own driver, on the Driver selection screen, select Record driver and select the CandyBox you wish to utilize for recording. Then press Next to start recording the first button. During the recording process, Suitest will ask you to press specific buttons on your remote control. While pressing, keep aiming at the CandyBox with your remote and make sure that there is a clear path between the remote control and the CandyBox. For best results position yourself at a distance of about 1-5 meters (3 - 15 feet) from the CandyBox. When instructed by the Device Wizard press the button on your remote control while aiming it at the CandyBox. When the recording is successful Device Wizard will ask for a confirmation press to make sure the recording is accurate. As the last step of the driver setup process Suitest will request you to verify that all the keys are working as expected with your device. When you press Blast Suitest will emit the key signal. If the key signal has yielded correct action on the device you should press Success and wizard will progress to the next key. If the key does not seem to do anything try putting your TV into a mode where the key is guaranteed to have an action. For example to verify if the Teletext key works be sure to switch the input mode to "TV" and browse to the channel with a teletext enabled. The last button to verify is Power and it should power off your TV to be successful. Press Blast again to turn the TV back on. On HbbTV / Freeview Play platform Suitest can automatically verify a subset of the recorded keys. The device wizard will inform you that the automatic button test is about to be started. Before starting the automatic test, double check that the Suitest channel is currently open on the device and that the Suitest badge shows up. When ready press Start test to proceed. After you complete the driver verification process your device will be added to your Suitest account. Continue with instrumenting your app and then start testing! Please check the Smart TV troubleshooting section for guidance.